Thanks for visiting By&By Estate & Moving Sales. 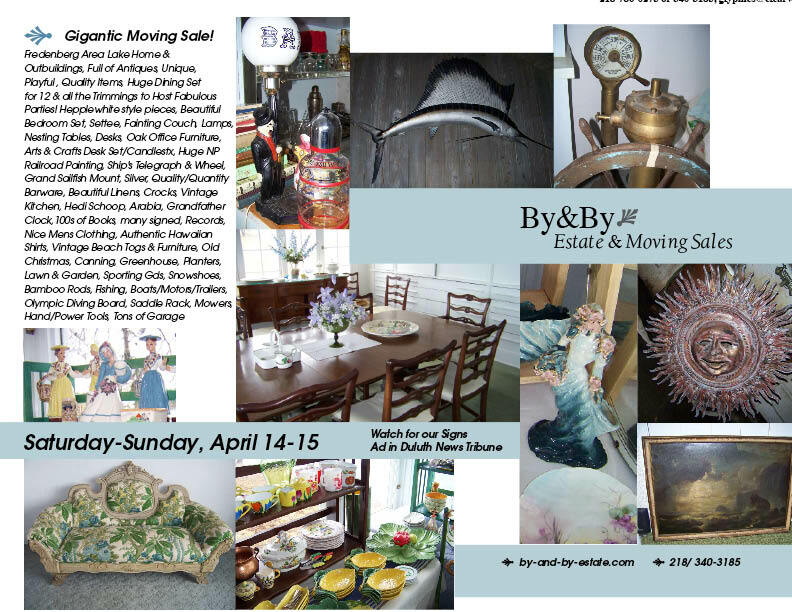 We appreciate the opportunity to help you with your estate sale, moving sale or appraisal, whether in Duluth or anywhere in the region. 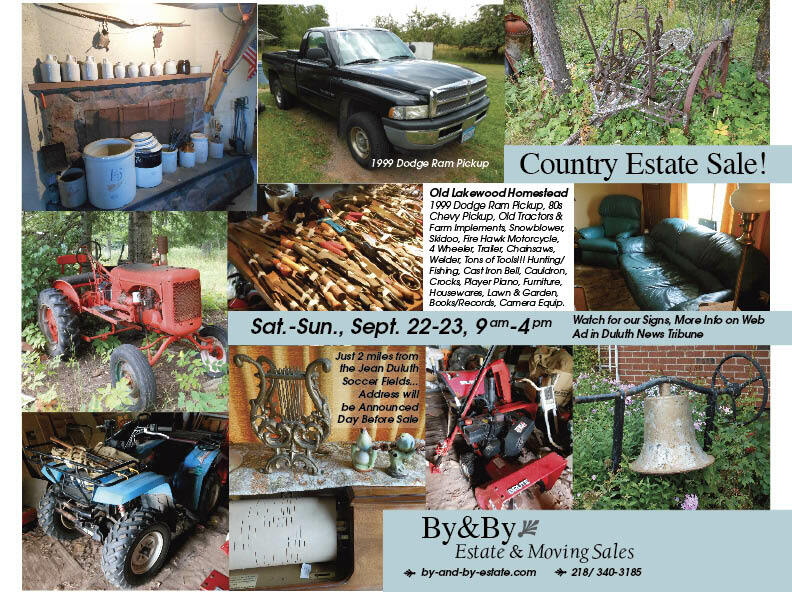 We have done sales in homes, large and small, in resorts, in farmhouses, lake houses and even the occasional off-premises sale. We will help you develop the best plan to meet your unique needs. Our goal is to help you liquidate your belongings and get the largest value with the quickest turn around. We have a great track record of terrific results. 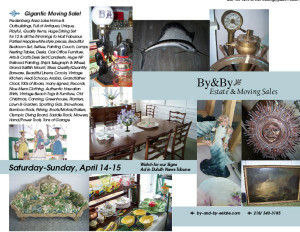 By&By Estate & Moving Sales was formed in 2005 to help people sell their unwanted belongings. Whether you've lost a loved one or you're simply downsizing, you can trust this daunting task to us. We can do everything from sorting, pricing and display to sale promotion and management. We are known to go above and beyond to meet your goals and exceed your expectations. 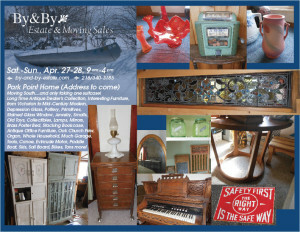 Check out flyers we sent out to advertise some of our past sales below. 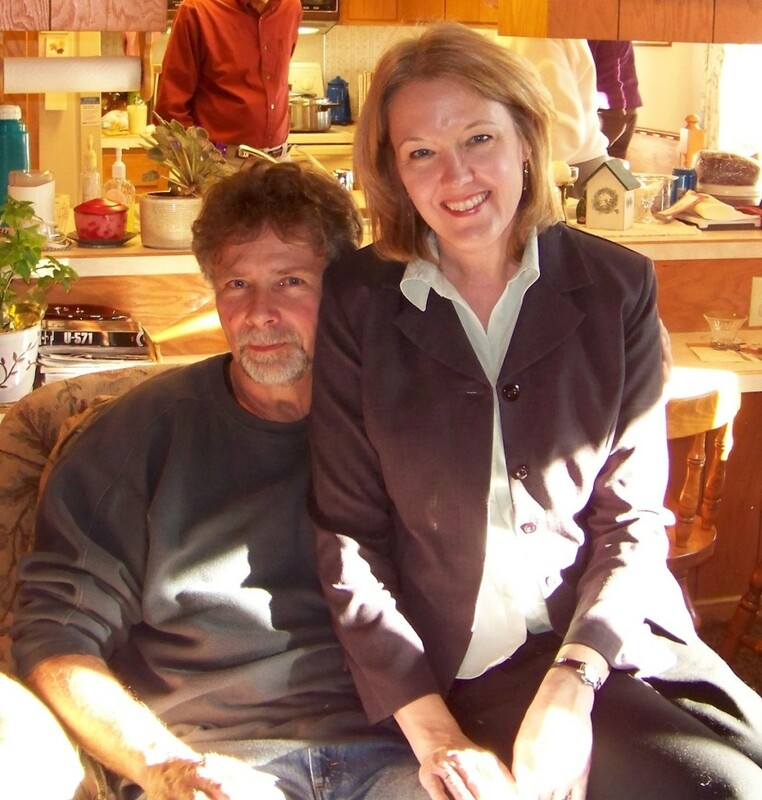 When Terry and Linda were married in 1997, Terry had already been in the antiques business for many years, as well as owning the Record Store in Duluth since 1982. 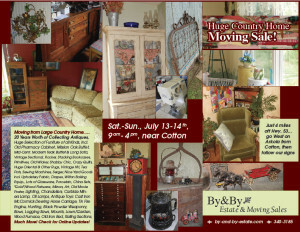 Linda soon caught the antiques "bug" and began collecting vintage clothing and accessories, while tagging along with Terry to antique shows throughout Minnesota. Terry had been doing estate sales for years and Linda found that she enjoyed helping him with this. They did this for a few years before deciding to name their new joint endeavor in 2005, and Terry thought of the perfect name - By&By Estate & Moving Sales. Terry has an almost encyclopedic knowledge of many genres of records, specializing in 1960s Garage Rock, pre-1980s Rock & Roll, and Hillbilly, Blues, Jazz and Gospel, to name a few. He still sets up at monthly Record Shows in the cities. Besides having an impressive collection of records, he collects many other pop-culture artifacts, like radios, juke boxes and advertising graphics. He is talented in restoration of paintings, signs and printed materials, as well as the occasional special project. Terry is always expanding on his knowledge and, through the years of doing estate sales, he has gained expertise in coins, brewerania, paper effemera, local history and appraisal. This is complemented by the expertise of his large network of qualified colleagues, featuring our personable friend Denny who hails from Grand Rapids. He often partners with us on sales. Linda has a design degree from North Dakota State University, where she studied Interior Design. Since then, she has been in the Environmental Graphics Design field, developing signage for buildings and public spaces. She has designed and specified several wayfinding sign systems regionally since starting Glyphics Design in 1994, which she continues to own and operate. In both her sign business and at By&By, the ability to bring order from chaos comes in handy. She is instrumental in envisioning the display of each sale with the goal of reflecting each personality through their stuff, as well as making the shopping experience more fun. She aims to do the same in online marketing and flyers for each sale, which we distribute to our supporters. People love coming to our sales because they are fun to go to. Terry and Linda enjoy doing what they do and so does their wonderful, hard-working and talented staff. And fun is contagious. With over 30 years of expertise in selling, buying and restoring antiques, doing appraisals, and running sales, we have the expertise to help you sell your unwanted belongings. You'll be surprised at the values and pleased with the results. Please call us for a free consultation today.